This is one of those books I could not put down. Maybe it is because here in Florida we have just entered hurricane season. Maybe it is because I’ve lived here long enough to have gone through several. Although my city has not had a direct hit in years this book was so spot on, it reminded me that it could happen right where I live. I was right there with the family trapped on St. Simons Island. It reminded me of a few years ago when I worked at a hotel on the beach. They shut everything down and evacuated everyone as a hurricane headed our way. Two co-workers left to secure things did not get off before the bridge to the island was closed and they had to ride the storm out in the hotel. I had the same scared feelings for the family as I had for my friends. The information was so good but not like reading an informational text, that I felt as if I was in the plane with the hurricane hunters. This is truly a job I would never want and I greatly admire the people who put their lives on the line for us. This is a wonderful book to read. 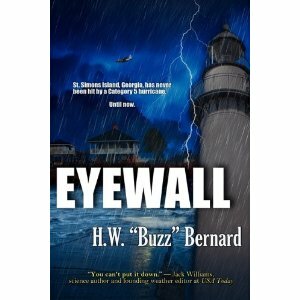 If you live in a hurricane prone area I definitely recommend this book to you, but not during a hurricane. I look forward to more work from this author.